We probably will never know for sure, but I think today (6th September 2014) was the last day of the Fishguard’s trial enhanced rail service. This post went live at 21:00, as the last train of the day was scheduled to depart Fishguard Harbour. We can, however, be fairly sure that there will still be six trains per day (plus one at night) on Monday as the Welsh Government have annouced that the trial was a success and agreed to fund the service as a full component of the Arriva Trains Wales (ATW) franchise, which runs until 2018. I wasn’t able to make any of the trial services today, but wanted to mark the occasion with a trip on the line so had to settle for the daytime boat train. In the event, I was dropped off at Whitland station at about 12:10, in time to see a class 150 unit arrive from Pembroke Dock on a Swansea-bound service. 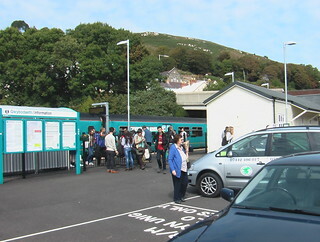 Once that had left, I moved to the westbound platform to await the Fishguard service, which was being shown on the passenger information system. 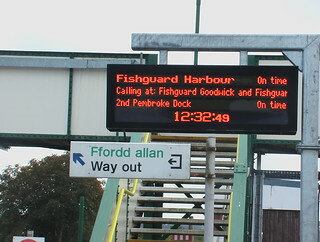 I noticed that the remaining calls on the service were listed as “Fishguard Goodwick and Fishguard Harbour”. I have noticed that mistake before at Llanelli, but this suggests the problem is more widespread and still hasn’t been fixed. The boat train duly arrived, almost on time, about half an hour later. Sadly, the unit was another class 150, not what one hopes to see on the only express service into and out of south-west Wales. After some time when this woefull allocation of stock was ATW policy, I believe the service is now supposed to be worked using a much-nicer class 158 unit. However, they often seem to be short of 158s and the dreaded 150s have to deputise. I boarded along with (I think) six others. Since I was starting from Whitland however, rather than coming all the way from Cardiff, the views on the rural trip along the Fishguard branch largely made up for the metro-sliding doors and absence of legroom on the 150. A little while later, we arrived at Fishguard & Goodwick where I alighted along with many others. Providing a useful local service on the Fishguard line is therefore proving to be a worthwhile use of the Welsh Government’s money. I dashed out of the station and, after looking both ways, across the road to grab a video clip of the train heading down towards the harbour. After that, I started climbing the hill towards ‘Stop and Call’ (where that name comes from I have no idea) to find a vantage point to film the unit departing Fishguard & Goodwick with the return trip to Cardiff. Another ‘Trains For Fishguard’ video is therefore a possibility, maybe even for release on Monday, but I’m not making any promises. A quick walk down the hill got me to Goodwick town centre just in time to catch the Optare Solo on Richards Bros’ 410 bus service all the way up to Stop and Call, then back down, across and up to Fishguard. There, I had a fair wait in the library (looking railway books) before heading back outside to catch the Richards Bros 412 home. Flagship Optare Tempo YJ55BKF* was on the working, as I had expected. Returning to the news that the full Fishguard trial service is to continue, there is a key question: is it good news? Yes, of course it is. It is however not quite a decisive victory. 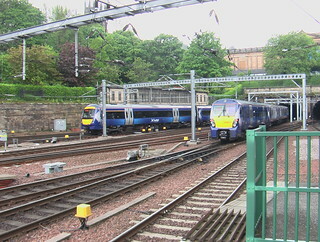 The survey carried out, towards the end of the trial period, to help inform the decision of whether to continue with the service suggested that more options were under consideration than just ‘retain service’ or ‘cancel service’. 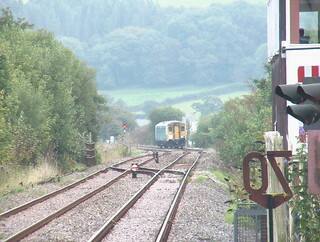 One possibility was retiming the second train of the morning out of Fishguard to provide an arrival in Carmarthen at arround 08:45, instead of arround 9am at present. Another was replacing the last evening train with a later service, in the process eliminating one of the changes that are currently required at Clarbeston Road. There was even an option of additional workings to make the service run every three hours throughout the day. The government’s announcment however does not mention any of these further improvements, the level of service available during the trial will continue unchanged. Good news then that the service will be retained, but not as good as it maybe could have been. And, as seen today, ATW still fails to get the name of one of Fishguard’s stations right and still fails to provide suitable rolling stock for the boat train (although I suppose if there is no 158 available it is better to run something than canceling the train and providing a replacment bus; that said, sitting on YJ55BKF I did wonder whether it was more comfortable than a class 150). * I don’t know if Richards Bros officially have a flagship, but I refer to Tempos YJ55BKE and YJ55BKF, which are of the same spec, as flagships as they are the best buses I have yet been on. Note: I did just about get this post out at 21:00, but it was incomplete. I’ve edited it to extend it quite a bit. Not long now… In just 17 days time, on the 18th of September (2014), Scotland will vote on whether to become an independent country. Although most of the predictions say that Scotland will remain part of the union, I am slightly concerned that the outcome of the referendum could be a surprising ‘Yes to independence’. While I am in favour of devolution, to the maximum extent possible, both at home in Wales and in Scotland, I do not want to see the United Kingdom broken up. 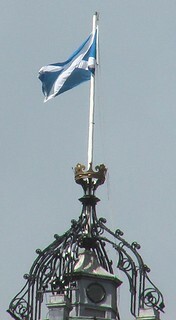 To start with my most trivial concern, removing the Scottish Saltire (Saint Andrew’s white cross on blue) from the Union Flag would ruin the appearance of the flag. Of course it is not clear whether Scottish independence would in fact result in a change to the flag, but I do think it would be rather dull without the blue background. There are far greater concerns however. The north sea oil and gas reserves have featured quite prominently in the debate over Scotland’s future; economics however is not one of my strong suits. 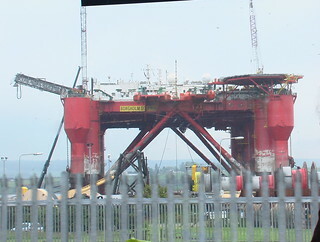 I cannot understand why the economy is regarded as such an important election issue and what effects it, but as far as the Scottish independence referendum is concerned the gist seems to be if Scotland can extract enough oil and gas it will have a strong economy. As George Monbiot once said: there are enough fossil fuels left to fry us all. If Scotland becomes independent, it may well be founded on the basis of the fundamentally unsustainable continued burning of fossil fuels. We are stronger together, in the face of threats to the natural world and national security alike; perhaps even the economy although, as I’ve already suggested, I really don’t have a clue about that. Thus, I say, the United Kingdom needs to stand united, stand tall and face it all together. They say the whole is greater than the sum of its parts, I hope this is true and that we can work together to counter all the threats the world throws at us. Again, as Monboit said we need to leave the fossil fuels in the ground, an independent Scotland reliant on extracting fossil fuels for its prosperity is all we need. I don’t often agree with members of the Conservative party, but for once the prime minister has said something I agree with wholeheartedly: Scotland, “we want you to stay”.